I'm glad you're all enjoying these posts - but here is the last of the skirt suits that I have made (well winter suits anyway, the summer ones will have to wait). This is the outfit I wore to work last Thursday. This jacket is also made from Simplicity 9839 - the pattern I used for the maroon suit, but I modified the wing collar to a shawl collar, by redrawing the collar piece with a gentle curve using my French curve rule. This jacket I did line, with a bemsilk lining, because it was very fraying and I wanted to serge the seams rather than bind then, plus I learnt my lesson re lining jackets after the maroon wool jacket. The skirt is made from Vogue 9615, which is an a-line skirt with a wide yoke (but I left off the pockets, because I didn’t need any excess fabric over my saddlebags!). I made this jacket early last year, and have worn it quite a bit. It is made from polyester - yes I’m admitting it, I don’t ordinarily use polyester fabrics because I prefer natural fibres and I find sewing and pressing polyester a bit hit and miss sometimes. But when I saw the lovely colour and pattern of this fabric in Lincraft, I purchased it (when it was on sale of course) regardless of the polyester-ness of it. There are quite a few pulls in the fabric now due to the loose weave, so I may have to retire it soon. It also wrinkles quite badly for a polyester suit – check out those creases in the sleeves after a day of wear, almost makes me want to keep my arms straight at all times to prevent them! I wore this suit with a RTW boat neck top in a maroon knit, and matching maroon patent leather peep toe heels. So for last week, by Thursday I was at eleven made garmets from twelve worn garments, with my percentage dropping to 92%. But that is still pretty high, so I'll have to see how long I can keep it up past this week that I'm documenting. And in response to the question asked on the last post from Lucette, winters in Sydney are very mild. Definately no snow or ice, barely any frost even, and if the temperatures dipped to 10 degrees Celsius it would be on the evening news as a cold snap! Sydney is on the coast, and many people still swim in the ocean during winter (not me though), and in fact many Sydney women despise giving up their flesh baring summer clothes during winter so much that they still get around in open toe sandals, thongs (aka flip flops), skimpy dresses and their fake tans, with their only concession to the cold being a scarf! Thank you all for the lovely comments on the previous wardrobe posts - I'm glad you're liking them and I hope I'm not boring you with all the details. I do love blogs about what people wear on a daily basis, particularly Kasmira's What I wore today, because she has such a great sense of adventure and colour combination skills. But boy is it hard work to take a photo everyday, particularly now that it's nearly winter here in Sydney and the light is pretty bad, hence all my indoor photos. You may recognise both the skirt and jacket from this suit. 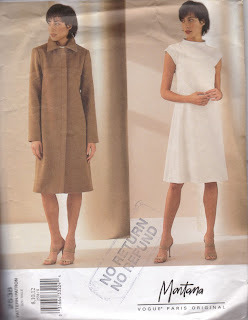 The jacket is one of the four that I have made so far from Vogue 2641, the Donna Karan pattern that I posted for the blue wool skirt suit. The skirt is the flared yoke skirt that I made for the Burda WoF skirt suit posted about here, which is Simplicity 5914. The fabric is 100% wool purchased from Lincraft when it was having a sale, because the original price was $39.95 per metre, but I think I bought it at $19.95 a metre. It is a very smooth and soft wool, not at all scratchy like some wools can be, in an olive green colour, with white and pale brown polka dots. It really is striking, whilst still being subdued because of the soft, autumnal colours. Because this fabric is a bit thicker than the wool flannel I used in the Burda WoF skirt suit, the hem of the skirt sticks out a bit rather than sitting in lovely folds around my legs. But it does get that glorious swishy action when I walk, so I still like it just the way it is. I wore this with a white cotton shirt that I made last year, from a sloper pattern that I made after doing a pattern making course at the Sydney Community College. This shirt pattern is brilliant, I get such a good fit and am able to churn out a shirt very quickly using it, so I guess it is another TNT pattern. You know I have so many more TNT patterns than I ever thought I did now that I am documenting what I’ve made. That would be my messy office in the background - I think all the papers laid out strategically fools a lot of people into thinking I am super busy! So I am now nine garments worn from nine garments made, still 100%. I have to admit though, because I knew I was going to keep count I did deliberately wear more of my made clothes than RTW clothes, but I still think that most weeks my outfits would consist of around 60 – 70% of made clothes, so it does justify my pattern and fabric stash (are you reading this husband?). So continuing on with the experiment of seeing how many of the clothes I make I wear each week, last Tuesday I wore a skirt suit I had made, with a cotton shell top that I also made, so now it is six from six, still a 100%. Yay for me! I made this suit in 2005, and it is practically my favourite suit out of all my RTW and self made suits, even if the collar style is a little dated. It just fits so well and the fabric is absolutely lovely. The jacket is made from a 1981 Simplicity 9839 pattern, purchased from an op shop for the princely sum of 50c (which is the most I will pay for a pattern from an op shop by the way!). It has princess seams which result in a well fitting body and a very 1980s style wing collar. 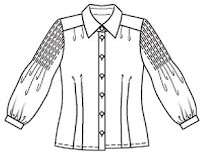 The sleeves also have a dart at the elbows for wearing ease. It also has a waistband facing that extends from the front facing around to the back, which gives a nice, curved finish to the hem. The only thing I dislike about this pattern is that it is for an unlined jacket, and stupidly (plus a bit of laziness) that is how I made it. I finished the seams with bias binding, but since this is a wool suit made to wear in winter, I should have made a lining, and I plan to do so soon. The skirt is just a pencil skirt which I can’t even remember which pattern I used, but there is nothing fancy or special about it. The fabric I purchased some time ago from a garage sale, where a lovely old Italian woman invited me in to her lounge room which had fabric draped over every available surface. She made me a cup of tea and told me about a lot of the fabric and picked out bits and pieces for me, and I ended up buying quite a bit of her fabric for a very reasonable price. This fabric has a small scale white and maroon check and was so easy to sew with because it pressed nicely and generally did what I wanted with it! On Tuesday I wore this to work with a white textured cotton shell top, made a few years ago from Vogue 1826, which also has princess seams and a rear centre back closure, which I used a line of buttons instead of a zipper (and as a result requires contortionist moves to do it up!). You can only see the top of it peeking out in this photo, but I'm sure it will make another appearance sooner or later because I wear it a lot - it fits superbly and goes with practically everything. The shoes are very tall heels to make up for Monday’s sensibility, in a beige linen with brown leather straps and buckle. I was going to do a post on what I wore during the week to see how many of the clothes I have made I actually wear, picking up the idea from the discussion over on Pattern Review and posts on few other blogs, such as the Lean Mean Sewing Machine and Two On Two Off. I have to say that I actually wear everything I finish (and as you know not everything gets finished!) at least once. Sometimes after an initial wear things may need a little further tweaking (and sometimes those garments end up in the UFO/WIP pile! ), but mostly I fix them and wear them again. But I realise that most of the things I wore last week were made in my pre-blogging days and hence haven't been mentioned here. So instead of one big post, I'd thought I would post them individually so I could give the details about the patterns and fabric for each one. 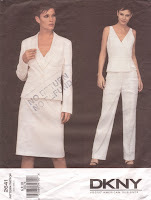 First up, on Monday I wore this suit I made last year from Vogue 2641, a 2002 Donna Karan pattern which is now OOP. I really love the peplum style, I think it is good style for a pear shape because it was easy to nip in at the waist but flare out to skim over the hips. I also made the matching knee length straight skirt, but with a wider waistband to get that high waistband look. I realise now that I find high waisted clothes very uncomfortable and I plan to take the waistband off and either replace it with a narrow waistband or just with inside facings instead. Anyway, this is a really great pattern which I have made four times now, so I guess it classifies as a TNT pattern! The fabric in this suit is a wool blend, in a royal blue with black flecks, and a golden thread check running through it, purchased from the Remant Warehouse (which is moving to Botany Road in Alexandria on 2 June for all you Sydneysiders reading this). The button is lovely blue vintage button purchased specially from a shop down in the Rocks called Buttons Buttons Buttons, which as the name suggests sells nothing but buttons, but they literally have thousands to choose from so they are a good spot to pick up something unusual. On Monday I wore this suit to work with the Burda WoF blouse from my last post, but after I had taken the photo in the last post I had somehow gotten make up on the collar, so I had taken it off to soak before I remembered that I neededto take a photo of the suit. So here it is shown with a RTW top, but in reality Monday's tally was three from three - 100% so far! And the shoes are vintage purchased from ebay, a navy blue leather with cream piping and a silver buckle, which have a low chunky heel that are very comfortable and sensible for those days when I can't bear to squeeze my feet into a real pair of heels! So on to the latest creation. I made the pin tucked sleeve blouse 125B featured in the January 2008 magazine. Imaginatively, I made in a white herringbone weave 100% cotton that I bought in Bangkok earlier this year for some crazy cheap price, and I bought heaps of it too, which was lucky because with those voluminous sleeves this pattern uses a lot of fabric for a shirt. It was lovely fabric to sew with, and lovely to wear so it was an all round bargain in my books. The pattern was rather simple, it is just a shirt after all. The pintucks were a bit fiddly, but made easier to get straight because of the stripes in the fabric from the herringbone weave. After seeing the beautiful orange stretch satin version the Peacock Chic made, I realise mine could have been a lot harder to sew but could also have been a lot more brighter and fun too! Ah well, I did need another white shirt. Boy I look really pale in this photo! I did wear it under a suit I also made (yet to be blogged about) in a royal blue with a gold check wool fabric, and a pair of red shoes (of course! ), so it wasn't as dull an outfit as the above photo suggests. Because it was rather chilly in my office I kept the jacket on all day, so no one even noticed it was a new shirt. Perhaps the shirt will be better worn under a tunic (ie a jumper dress) or just a vest to show off the sleeves to their fullest. Originally I made version A of this shirt, with the extra large cuff that is to be worn turned up. I even went and specially bought the 19 (!) required buttons (a trip to the fabric shop that entailed in me purchasing more fabrics) and made all the button holes, but the sleeves were way too long, and my fabric just wasn't crisp enough for the cuff to turn up properly, so I cut some of the sleeve off and made narrow cuffs as per version B of the pattern. Note to anyone else considering making this - check your sleeve lengths! I also used this tutorial that I found on on Pattern Review for this blouse to do the collar stand. The lady who wrote this tutorial based it on the David Coffin shirtmaking book that quite a few of you are raving about, and after using this technique I can fully understand why. Well, I have my next Burda WoF pattern already traced off, a jacket also from the 1/08 magazine and I need to get busy on improving that cost/make ratio! I have been so busy this week that I didn't finish a new garment over the weekend / through the week as I have been endeavouring to do this year. So far so good though, we're currently in week 19 of 52, and I have completed / refashioned / finished UFOs for a total of 24 items plus muslin, so I'm still on top of that new year resolution. Anyway, the cool weather here in Sydney means it is time to pull out my new favourite winter dress that I made last year and have already worn many times. It is made from Vogue 2538, a Montana design, which is already OOP but I just checked and it's a 2001 pattern so I guess it's not that new! I can't remember when I purchased it, but I do remember buying it to make the jacket which I never ended up doing. I love this dress - the simple styling with well placed darts and shaping to the dress at the waistline is very flattering without being clingy. I used the sleeves from the coat instead of the little cap sleeves since it is a winter dress after all, but cut them off at the elbow and used a narrow band to create a bit of puffiness to them. The fabric I used is a cream wool with a light grey brown check pattern - yeah even though the pattern said it was not suitable for obvious diagonals, plaids or stripes I used it anyway! Fabric thrifted of course, from some op shop or other and washed in some eucalptus liquid wash it came up like brand new. I usually wear it with some black opaques to get a mod look, and worn with one of those thermal spencer tops underneath it's very warm to wear and it certainly stands out in winter when everyone else is wearing black, black and black. You know, I never realised until I started blogging how much I like to go against the grain and avoid conformity, particularly in fashion, but I don't think that's a bad thing and it's certainly a major reason that I sew - to be individual and stylish, not a slave to fashion trends. 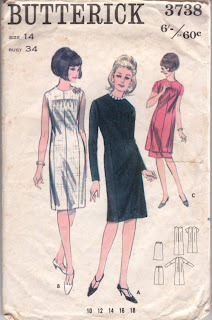 This lovely Butterick 3738 pattern is undated, but it must be around 1966 because that is when the currency in Australia changed from pounds & shillings to dollars and cents, and if you notice on the pattern the cost is 6'/- or 60c. There was even a jingle at the time to help people remember and understand the change, my mum remembers every word and can still sing it even though she would have only been about 10 at the time! Anyway back to the dress - it's a simple shift with a gathered front panel with a long centre dart that extends from the bust to the hem. I made this from a lovely navy blue wool, lined with a polyester type fabric in navy blue with white polka dots, both purchased for bargain sums from op shops. All in all I'm very pleased with this dress, it's so comfortable and I got quite a few compliments at work yesterday so it's definately entered rotation in my wardrobe! http://incurablehomebody.wordpress.com/ - this is a new blog I found recently, and I love the colour mixing of the lovely clothes and the amazing photography, plus I totally emphathise with the homebody bit! The books closest to my computer are my husband's university texts (anyone interested in land valuation methods? didn't think so), but the next closest book in my bedroom would be the one I am currently reading - the George Orwell classic Animal Farm. I haven't read this since high school, but I found it in an op shop for 25c so had to buy. It was originally purchased on Saturday May 24 1971 at Essendon Airport by one Sarah Baker, according to her lovely script on the inside cover - she bought this before I was born but now I am enjoying re-reading it. They explained that by their studies of the past three months the pigs had succeeded in reducing the principles of Animalism to Seven Commandments. These Seven Commandments would now be inscribed on the wall; they would form an ulaterable law by which all the animals on Animal Farm must live for ever after. With some difficulty (for it is not easy for a pig to balance himself on a ladder) Snowball climbed up and set to work, with Squealer a few rungs below him holding the paint pot. Anyway, I'm supposed to tag 5 more people, but since I've broken one rule I'll break another. I'm a bit shy at sending these things on since I don't personally know other bloggers and I don't know if they dislike these chain mail type of things (I don't really, but I don't know about others). Stay tuned for a regular post shortly - I have finished another vintage pattern that I will be posting soon! I started this maroon wool shift dress at least 8 years ago using a now OOP New Look 6697 (which interestingly enough New Look have already reissued a different dress pattern using that same number). It is the long sleeved round neck version shown in green on the pattern envelope. At the time it fitted okay, except for being a bit short - it finished above my knee before hemming which I don't like on me, and it was too austere and a bit boring for me to be wearing in my early 20s! So I never finished it, but because I liked the maroon wool fabric, I put it in storage thinking that one day I would reuse the fabric. Then I saw this lovely maroon/purple dress with red bands over at the Boden web site and I thought I could do something similar to save my maroon dress. Luckily enough I had some lovey raspberry red wool crepe in a similar weight to the maroon wool, so using the pattern I drafted up bands for the neck, hem and wrist line. Also lucky that I have stayed pretty much the same weight for the last 15 years or so, otherwise all hope would be lost for these long term UFOs! I decided to keep the long sleeves since this would be a winter dress, but I just added a narrow band to keep it in line with the rest of the dress. I also replaced the lapped zip with an invisible zip because I like the look of an invisible zip so much more and I don't know what my previous aversion to them was. I added a lining, and hey presto, a UFO is completed, by refashioning it into a RTW knockoff. In response to Melissa who asked in the comments in the last post, last weekend was the Anzac Day holiday here in Australia, commemorating war veterans. I usually go to the dawn service and war veterans march, but I went away for the weekend instead. Life got in the way of a solid three days sewing potential, but I do have to keep reminding myself I sew clothes to wear out, not just for the sake of it, so I do have to go out now and then! And thank you all for the lovely comments on the TNT dress four ways in the last post. Valerie I love the back of the dress more than the front too, in fact I once tried to make it with the back on the front but yeah, that didn't work, a little too low cut for it to be publicly acceptable! Colette I think it is very funny that everyone refers to brown polka dot print by mentioning Pretty Woman. And christina it's lucky we don't live in the same city, otherwise we might give each other the evil eye if we ever saw each other on the street in your blue polka dot and my brown polka dot dresses!